Extremely good way to deal with erectile dysfunction problems for boys living in New Zealand is found. Simply buy viagra nz online and get fast and reliable delivery for the tablets of your choice from genuine online pharmacy. The HPV Laboratory Project undertaken by CPAA is the first of its kind to be started by a NGO in India. As a part of its CSR initiative, Mazgaon Dock Ltd., a Public Sector Undertaking under the Department of Defence Production, Ministry of Defence, Government of India has sponsored the setting up of a CPAA's HIGH RISK ONCOGENIC HPV SCREENING LABORATORY in Mumbai. They have also set up a fund to provide free HPV test for 5,000 women including underprivileged women for screening risk, early detection and prevention of cervical cancer. 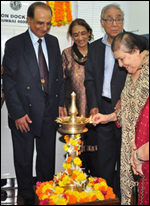 The project and the laboratory was inaugurated on 27 June 2013 at CPAA's Cancer Management Center at Mahalaxmi by Rear Admiral R K Shrawat (AVSM) - Chairman and Managing Director, Mazagaon Dock Ltd in the presence of Mr. Y K Sapru - Founder Chairman & CEO of CPAA and other dignitaries. CPAA held its first Cervical Cancer Screening by HPV DNA PCR test at the Women Health Camp, Mazgaon Docks, Mumbai, on 12th July for 132 women. Subsequently, a second HPV Screening camp was conducted for 100 women in the lower socio-economic group at Stree Hitkarni Camp at Dadar on 17th July. CPAA offers HPV testing at no cost, at the Naigaon clinic, and CPAA's screening camps. We are grateful to Mazgaon Docks for their support and providing CPAA the infrastructure to make the HPV test available. Cervical cancer is the most common cancer in females in India, with annual incidence of 135,000 representing about 27% of the global cervical cancer cases. High risk oncogenic Human Papilloma Viruses (HR-HPV) are the causative agents of cervical cancer, with the HR-HPV detected in 99.7% of cervical cancers. Thus, detection of the virus in women indicates the high risk of cervical cancer in the woman. It must be noted that not all women detected with the virus, will develop cervical cancer, and persistent presence of the virus is necessary for progression to cervical cancers. Earlier screening for risk of cervical cancer was tested by a cytological test called the Pap smear test, and it was an invaluable tool for screening women. However, with advances in technology, the Pap test needs to be replaced by HPV testing as the primary test for screening for cervical cancer risk in the population. A negative HPV test performed correctly with appropriate controls and technology indicates a low/no risk of cervical cancer. If the lifestyle and life partner is not altered, the test may be repeated after a period of five years. A positive HR-HPV test with no clinical symptoms, indicates a repeat test after about twelve months. Two consecutive test with HR-HPV positive, or two of three tests at annual intervals detecting HR-HPV positive, indicates high risk of cervical cancer. Follow-up of the women will results in early cervical cancer detection, resulting in good prognosis and cure, as well as down staging of cervical cancer in Indian women.